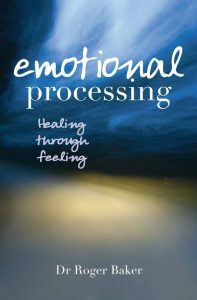 Roger Baker’s ground-breaking book, based on the extensive work of his research team, explains how emotional processing works and outlines problematic styles of emotional processing and their effects on quality of life. It presents a new way of understanding emotions and new insights into handling emotional pressures, and is illustrated throughout with examples from patients in psychological therapy and from everyday life. The book is divided into 4. Part 1 – The Secret Life of Emotions: introduces the theme of the book and shows how emotional and rational lives are equally valid. Part 2 – Dissolving Distress: looks at our second immune system, emotional processing, which helps us to absorb and break-down emotional hurts and strains. Part 3 – Healing through Feeling: covers the expression of emotions for good health and well-being. Part 4 – How to Sabotage Emotional Processing: provides a manual of bad practice.